Icaria™ is a new technology and service solution that provides a streamlined MEG4 transition, maximizes the life of your lines, reduces operational risk, streamlines communications, and improves the safety of your crews. Evolving industry guidance and regulations​ Icaria Compliance streamlines the MEG4 transition process and line management plan development with consulting from Samson engineers and detailed equipment compatibility assessments. Lack of infrastructure for MEG4 transition Icaria facilitates the implementation of your line management plan with ongoing condition monitoring and usage tracking. Uncertainty about when to retire the lines Icaria LineCare maximizes service life through operational best practices and data-supported predictive line life. Adopting MEG4 best practices for existing vessels or fleets ​Icaria LineCare and Compliance provide the framework for best-in-class line management to allow for operational compliance with MEG4, even if your vessels are not refurbished to account for deck equipment design guidance. 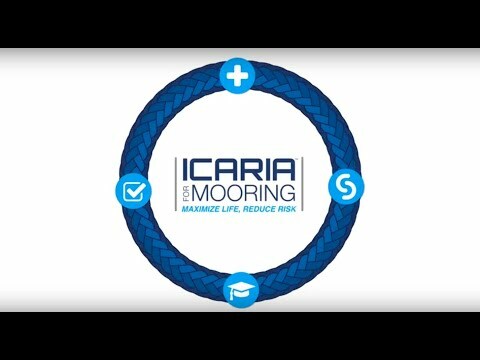 Safety risks associated with mooring lines Icaria competency management and training allows visibility into crew and staff course completion, delivering a safer working environment. Crew members that are inexperienced with high-performance synthetics Icaria Classroom generates comfort and security that lines will be cared for properly, extending their life and protecting your investment. Lack of consistent and comprehensive visibility to line and hardware condition Icaria Connect delivers real-time rope health monitoring, pro-active damage identification and corrective actions, maintenance plans, and 24-hour support. Limited financial resources Icaria-trained crews, data-supported decision-making, and predicted line life and reliability allow for optimized service life and incident prevention. OCIMF’s release of the fourth edition of its Mooring Equipment Guidelines (MEG4) provides recommendations for mooring system design, selection, maintenance, and retirement. With the Icaria Compliance program, Samson aids you in developing a plan for the transition to the updated guidance, for both new and existing vessels.